Cyclonaire offers the latest in sand-handling technology, ideal for all types of rail transportation, including light-rail passenger trams, remote branch lines, in-yard service tracks or high-speed mainlines. 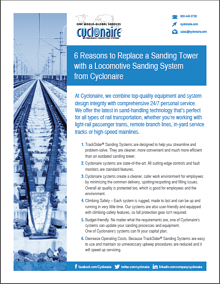 Learn more about Cyclonaire's locomotive sanding systems in our new guide, 6 Reasons to Replace a Sanding Tower with a Cyclonaire Locomotive Sanding System. Simply complete the form below to obtain your free copy.